Soviet plans for the creation of a vast industrial base were ambitious. The government issued orders for the creation of the enormous Gorki and Moscow Zavods (factories), with an intended combined annual production of 125.000 vehicles. Tractor and tank production was concentrated at the Leningrad Putilov Works and the Stalingrad Tractor factory. At the start of this titanic process, military production targets were set at modest levels in accordance with the limited resources available. The Red Army's production priorities were artillery, aircraft, tanks and other motorized vehicles. In the earliest proposals of 1926-28, a total of 1025 tanks were ordered, but the rapid strides made in th e creation of automotive and other heavy industries led to this total being increased to 3500 in May 1929. Soviet confidence reached new heights with the great tank programme of 1931 which called for the manufacture of 10,000 tanks in 1932 alone. This overly optimistic total, like so many during the plan, was not achieved, but it was still an outstan ding feat on the part of Soviet industry to turn our just under 3000 tanks. This gave the Soviet Union the largest tank fleer in the world at this time, a position it would not lose until the catastrophic defeats suf-rered at the hands of the Germans in 1941. The ability of the Soviet Union to expand her industrial, and consequendy military, forces at such speed was the result of pragmatic, though at the time harsh, policies. The creation of a large workforce with rudimentary technical skills was accomplished through a series of policies introduced by Stalin. Agricultural reform termed collectivization - involving the creation of large state-run farms by dispossessing many peasants of their land - created a surplus of labour that could be used in the new expanding industries. In the factories, ineffective management was brutally repressed and harsh punishments were carried out on those who failed to meet production targets. Enthusiastic for its new weapons, the Red Army was not averse to using its soldiers to enforce the new policies in rural areas. Sevaal of the new military plants were in effect run as slave-Iabour camps. Viral to the process of industrialization was foreign expertise. Stalin and the Revolutionary Military Council spent the Soviet Union's gold reserves on acquiring American and German technical experts and machine tools in order to circumvent existing deficiencies in Soviet industry and, at the same time, hasten its own build-up. American involvement in the Five Year Plan was notable for the fact that at this time the US Government did not officially recognize the Soviet tank (Union). Yet only limited - and easily circumvented - measures were taken to prevent technical cooperation and the purchase of US equipment. The first deal was made in 1929 with the Ford Motor Company, which helped design and build the vast Gorki automobile plant. licensed to build Ford trucks. This facto ry would become one of the largest and most important production centres for the mechanization of the Red Army prior to and during the World War II. The sheer scale of equipment purchases from the United States is illustrated by the Soviet Union spending $79 million alone in 1932, which included 64 per cent of all machine tool exports for that year. One area in which the Soviets became particularly adept and where they had notable success - with long-term implications - was the purchase of acmal foreign military vehicles as a basis for developing native models. Tanks in particular were purchased from a wide variery of countries such as France, Italy and Czechoslovakia. The most important foreign designs, however, came from Britain. the USA and Germany. The acquisition of British and American designs was undertaken in 1929 by a special commission of the Directorate for Mechanization and Motorization (UMM), led by the head of the Military Technical Board, General I.A. Khalepsky. As the British were at this time seen as the leaders in tank design, Khalepsky paid particular anention to acquiring vehicles from the country's only tank manufacturer, Vickers-Armstrong Ltd, in 1931. In particular the Vickers Carden-Loyd Mk VI tankette and Vickers-Armstrong E Tank provided the basis for several key early Red Army tanks. 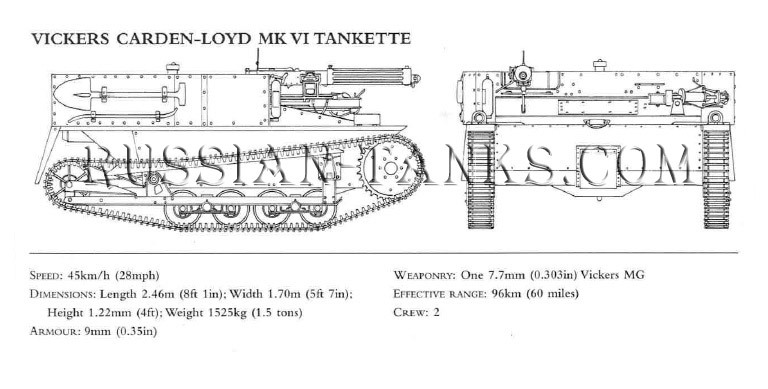 One of the first designs to arrive was the Vickers Carden-Loyd (VCl) MK VI tankette. This had been purchased because Red Army Armoured Regulations specified the need for a light reconnaissance tank. Soviet design teams had experimented with a number of their own ideas between 1927 and 1930. Based on rhe chassis of the T-16, they evolved the T-17 and T-25. bur these had remained mere paper projects. 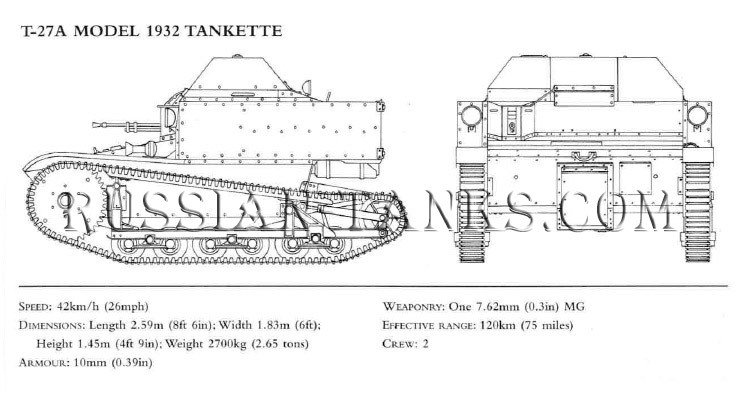 Only the T-23 experimental tankette was built. The extensive time needed to correct defects in the T-23 led to the decision to buy the proven British design. Soviet engineers weren't fully satisfied with the MK VI, and a team led by N. Korzyrev at Zavod Nr 37 in Moscow made a number of changes to the hull. Performance was improved with a more powerful engine. new clutch and larger drive sprockets. The T-27 was armed with a 7.62mm (0.3in) machine gun, but lacked a radio, which meant that communication with other vehicles had to be conducted with flags, a standard Soviet procedure at this time because of the primitive state of the electrical industry. 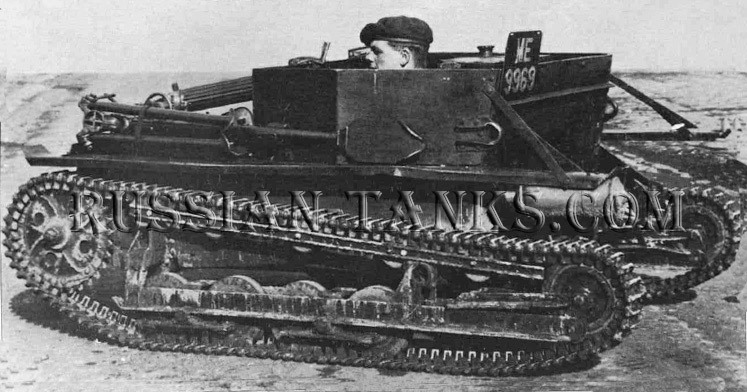 Several attempts were made to up-gun the T-27 by fitting 37mm (1.46in) Hotchkiss and 76.2mm (3in) Kt guns on the chassis, but these attempts proved to be largely abortive because of the inability of the chassis to cope with the extra weight, lack of stowage room for ammunition. and the instability and danger inherent in firing a large-calibre gun from such a small frame. In the field, the T-27 proved of mixed value. Its simple construction required low maintenance, but it struggled to traverse swamps and snow-covered terrain because of its narrow tracks. Lack of a t raversable turret and an amphibious capability was also acknowledged and led to the creation of the T-37 amphibious light tank. Even so, the T-27 was used extensively by the Red Army, which had 65 battalions each with 50 tankettes by the end of 1932. They were successfully used in operations in Central Asia to suppress the Basmachi uprisi ng in the 1930s. When war came with Germany in 1941, the T-27 had long been classed as obsolete and removed from front-line service. Some are reported to have seen active service during 1941, but this was more an expression of the desperation of Soviet armoured forces for replacement vehicles than reflective of the T-27's combat value. 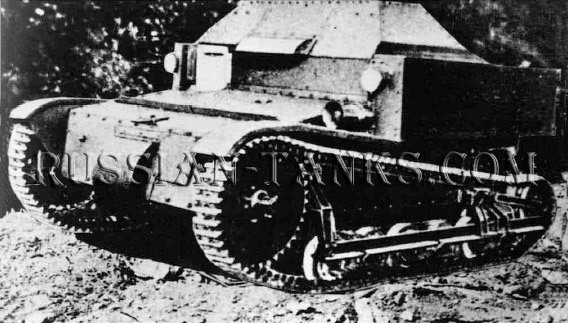 Yet the decision to mass-produce the Mk VI tankette as the T-27 in 1931 marked the real start of the creation of the large armoured forces envisaged by Red Army commanders in the late 1920s. When production ceased in 1941, over 12,000 vehicles had been built. It was, however, in America that Khalepsky, after long and complex negotiations with the eccentric and irascible designer John Christie, was to make his most important purchase. Christie had developed a unique tank suspension system, called the M1928 (read also Christie tanks). The Christie suspensions system of long, individual helicoil springs allowed for large road wheels, reducing the overall weight and enabling a tank to traverse uneven ground with minimum vibrations. The design was far from perfect, but unlike the US Army, Khalepsky, along with the British, saw its potential. In the end, Christie's modified design became the basis for the T-34 medium tank which is considered one of the finest tanks ever designed and was a bedrock of Soviet victory between 1941 and 1945. The most direct influences on the creation of Soviet armaments came from Germany. After World War I Germany, like the Soviet Union, was something of an international pariah. Cooperation between these two isolated nations germinated from the peculiarities of each other's predicaments that closely intertwined. In short, under the terms of the Treaty of Versailles the 100.000-man Reichswehr was permitted no planes or tanks. To the German High Command, the Soviet Union, with its vast space and closed borders, was the ideal place to secretly develop tanks and aircraft. To the Soviets, the benefit of access to German technical and military personnel and ideas was obvious. This mutually beneficial relationship began briefly in 1924, before several internal German political problems terminated the agreement. The attractions for the armed forces of both sides proved too great, however, and in the late 1920s cooperation resumed, which was to last until Hitler came to power in January 1933. In 1927 the Germans established a tank developmenc school in the Soviet Union at Kazan, referred to as the Heavy Vehicle Experimemal and Test Station. Despite the obvious advamages to, both sides, agreement was not achieved without some internal wranglings. Elements of the Soviet General Staff were opposed for military and ideological reasons. In 1928 the Kazan school was made operational with the arrival of 10 German prototypes, weighing 18.28 tonnes (18 tons) each, designed by Krupps and Rheinmetall. German aircraft were also tested at Lipetsk, near Moscow. Equally as important as military cooperation was the assistance received from German designers and technicians in many areas of the Soviet armaments industry. The exchange of ideas and acquiring of techniques were, at times, quite close. 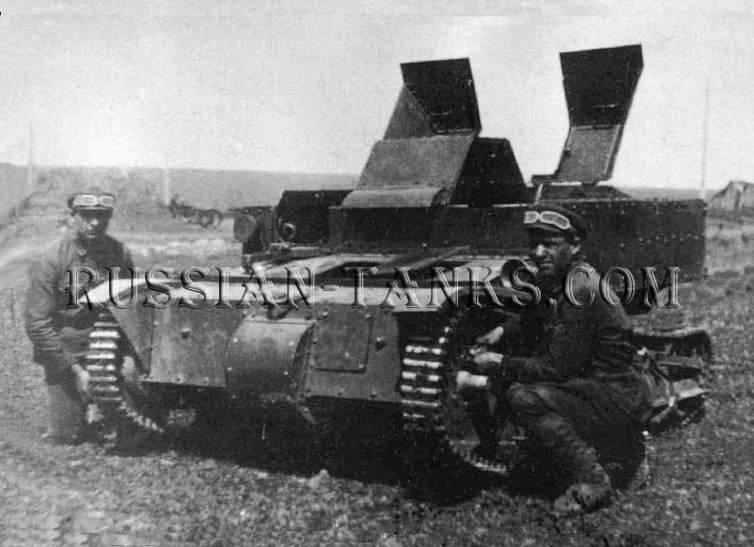 In 1932 a Soviet team which was headed by the German engineer Grotte, developed the TG-1 Heavy Breakthrough tank as part of the wider mechanization of the fled Army, and the Soviets also purchased and built under licence the Rheinmetall 37mm (1.46in) antitank gun. The relationship between the Reichswehr and Red Army was also one of distrust. Some senior Soviet officers such as I.P. Uborevich studied at the German War College, and a small number of more junior officers did attend German training courses at Kazan. In general, Defence Commissar K.V. Voroshilov preferred to train Soviet tank officers at the Red Army Armour Centre at Voronezh. The importance of these limited but invaluable exchanges on the development of each army's ideas on the combat employment of tanks is difficult to assess. Both looked extensively to the British Army's successful experience in World War I as well as its developments during the post-war period. As would be expected during any period of change in military affairs. German and Soviet military texts and articles at this point were translated and studied closely by both sides. But so were those of a wide number of other combative nations. Many of the conclusions about tactics which were reached during this era by the Reichswehr and the Red Army had strong parallels, but it stands to reason that they are so manifestly logical that it would be fruitless to try and argue which nation's designers and engineers inspired the other. What can be said with some certainty about this period is that between 1920 and 1930, the Red Army was a vibrant and imaginarive organization that was busily engaged in developing its own unique ideas about the combat employment of tanks. These ideas were not a pale imitation of Germany's, or of other nations. In fact, in some areas, the Soviets were to prove startlingly original.